Bits of Blackheath were covered in fake snow yesterday, apparently for a Bollywood film production, at All Saints Church. UPDATE: It appears to have been a romantic film directed by Yash Chopra, with the working title “Production 45”, starring Shah Rukh Khan and Katrina Kaif. Both Greenwich and Lewisham councils are intent on selling as much of their council housing to private developers as possible. 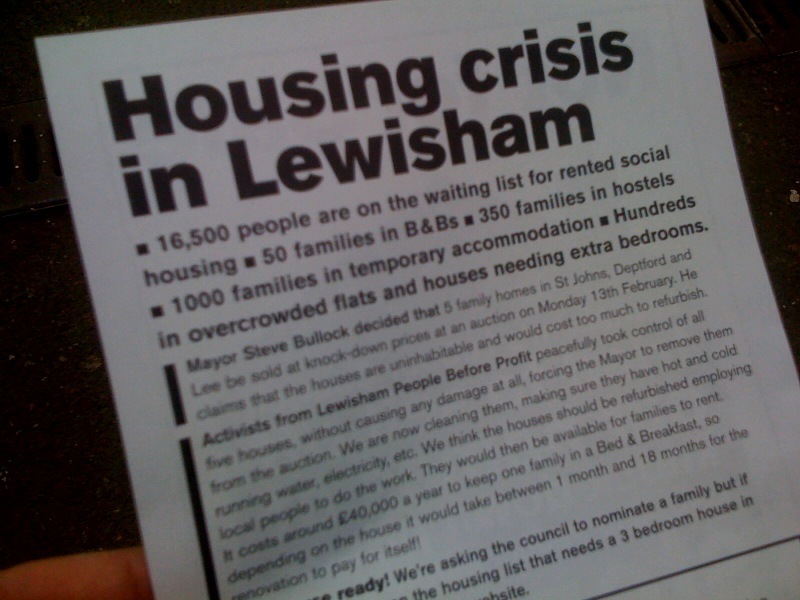 Above is a leaflet being handed out at Blackheath station by Lewisham People Before Profit. It’s not just Lewisham. Take a 178 bus through Kidbrooke, and you too can witness this happening in a real time Ballardian fever-dream. Council housing ripped down, next to NHS surgeries, and schools with children playing next to the rubble. Massive Berkley homes signs say “For London, for Everyone”. The council flats were for everyone. We owned them. The luxury flats are not. The council are selling our land to developers. It’s short term profit for long term misery. Local councillor Kevin Bonvia has emailed to say that plans are afoot in Lewisham to host two beacons in honour of the Queen’s Diamond jubilee. One is likely to be on the heath. See the PDF file here, and google map above, based on the grid coordinates TQ39501 76629 in the doc. More info on Liz’s homepage. There’s also an excellent article here, with a foreword by Jeremy Hunt, explaining exactly how best to light a fire. Which could come in handy if the government’s austerity measures get any worse. In the course of 2012, I’m also hopeful that our local councils (Lewisham and Greenwich) will manage to cook up a few high profile schemes that don’t involve the Olympics or the Monarchy, and will have a legacy longer than that of a few weeks. OnBlackheath, organiser of the proposed pop concert on the Heath, have advised us that they are cancelling plans for a concert this year, citing the exceptional level of activity in Blackheath already. This is welcome news in view of the heavy load on Blackheath in 2012. A point we were making in our earlier campaign. OnBlackheath are still planning an event in 2013. Every time I go into The Princess of Wales or the Railway pubs, the toilets almost never have any handsoap in them. It happened again to me today in the PoW, and it drives me nuts. These places sell food. I think it was probably AA Gill who said that if you walk into a restaurant, and there’s no soap in the loo, just leave. Let’s say you’ve got a normal immune system, and you go to the bathroom, wash your hands in a perfunctory manner with no soap, and later on decide to eat some chips or perform some other activity that transfers bacteria from your hands to the upper portion of your gut. You’ll probably be fine, just as you will probably also get away with driving while mildly-illegally drunk. But doing this buys you quite a lot of tickets in the Pathogen-Disaster Lottery. If you get a big enough dose of bad enough germs into yourself, your immune system won’t be able to react and shut them down before they’ve multiplied into too large a population to stop, and then you’ll be in trouble. Which, again to not be over-dramatic, probably won’t be the kind of trouble that kills you. But may be the kind that initially makes you afraid that you will die, and later on makes you afraid that you won’t. Why does the florists never open late? I’m a good candidate for Blackheath Village Flowers. I need to buy flowers once in a while (for Mrs Bugle… especially today). But they’re always closed by the time I come home (before 7pm). Is it a licensing thing? If you ran a florists, wouldn’t you stay open late on February 13th? Here’s their website: It appears to be broken. I’m guessing for Olympics preparation… As spotted by twitter user @shaawasmund.